...and am happy to report that there doesn't appear to have been any material degradation since the last MOT. Still plenty of surface rust, especially on the suspension components, but nothing that a wire brush and treatment shouldn't put stop to. 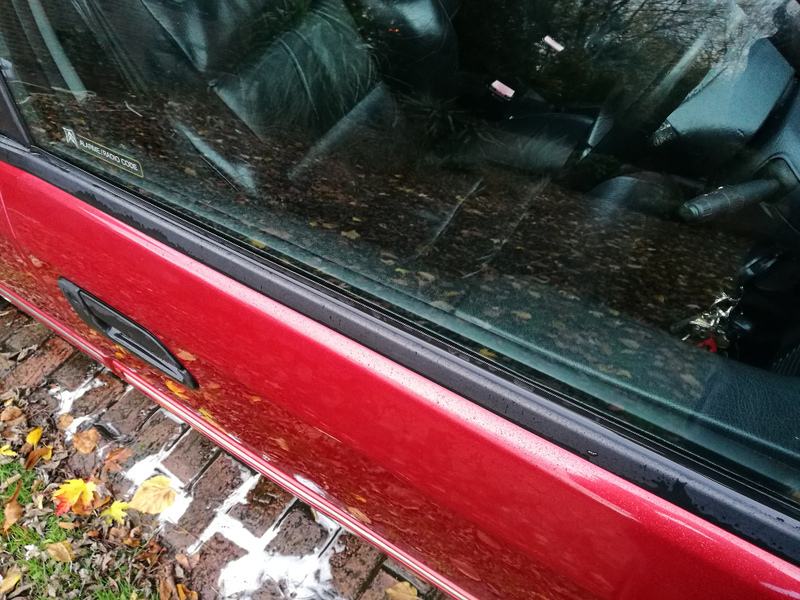 A few nasty looking areas on the sills revealed some peeling underseal, but nothing horrible underneath - I'll be going back and treating that in the next couple of days. Most importantly though, despite being quite firm with the screwdriver I use for testing for nasty rust, I didn't poke holes in anything! 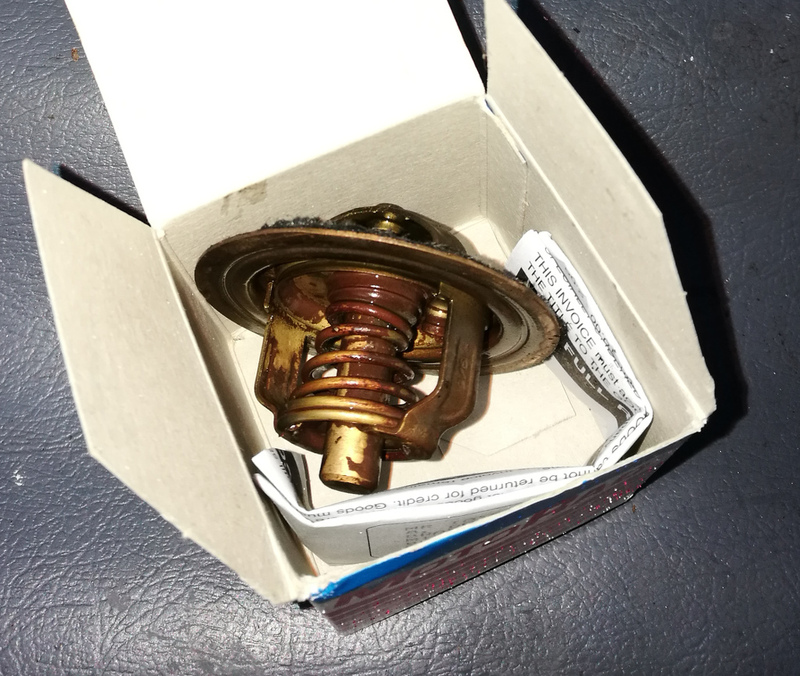 I'm also going to get a set of brake hoses ordered in because these are the originals and I don't trust them (once I ascertain exactly which set I need), and I've already got a new thermostat on the way to replace the current one which appears to be sticking occasionally. Really do need to figure out a better way of securing the ramps...getting on and off them is a royal pain. Both of these launched themselves into the garage the moment I started driving off them. Hopefully getting quite close to being ready to move on to her new home now. 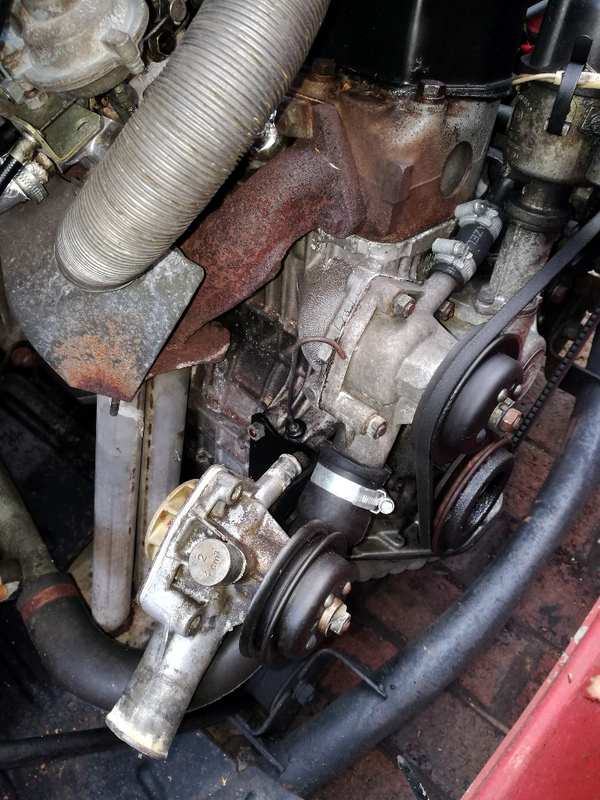 So today I went to do some work on the Skoda, my intention being to replace the suspect thermostat and to refit the original water pump given that it's now been proven to be nothing to do with the overheating problem. The fact that the aftermarket one on there (which came on my original 130GL) lacks the grease cup and that being missing bothers my sense of OCD. I wound up giving up on that today...Turns out that the tiny smear of gasket sealant I put on the seal when I fitted it apparently forms a *really bloody strong* bond after a couple of years, so it really didn't want to come off. 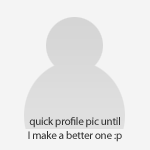 So have filed that under "come back to later." Likely with the engine still warm too as that will hopefully soften the sealant a bit. Only took me half an hour to get that horrible little 2" bit of hose between the water pump and the rigid line to the heater return line back on after one of the hose clips fell to bits. Third rear engined Skoda, and that bit of pipe has been an equal pain in the proverbial rear on every one of them when I've had to disturb it.  Anyhow, got back to the main tasks of the day - to flush the system out and to change the 'stat. Glad to report that the coolant that came out both when initially drained down and when reverse flushed was spotlessly clean - so guess I did a good job last time. The thermostat which came out is a Mahle one, so has been changed at some point before. Certainly not the worst looking one I've ever seen, wasn't obviously clogged up or collapsed...I'll test it tomorrow to see whether it opens/closes properly. If so I'll keep it as a spare. Annoyingly it didn't come with a replacement gasket, so I had to bodge things back together with the old one - I've ordered a new one though (all of GBP1.69), so will get that tidied up as soon as that turns up. Then just had to wait an eternity while the thing warmed up after refilling the system. 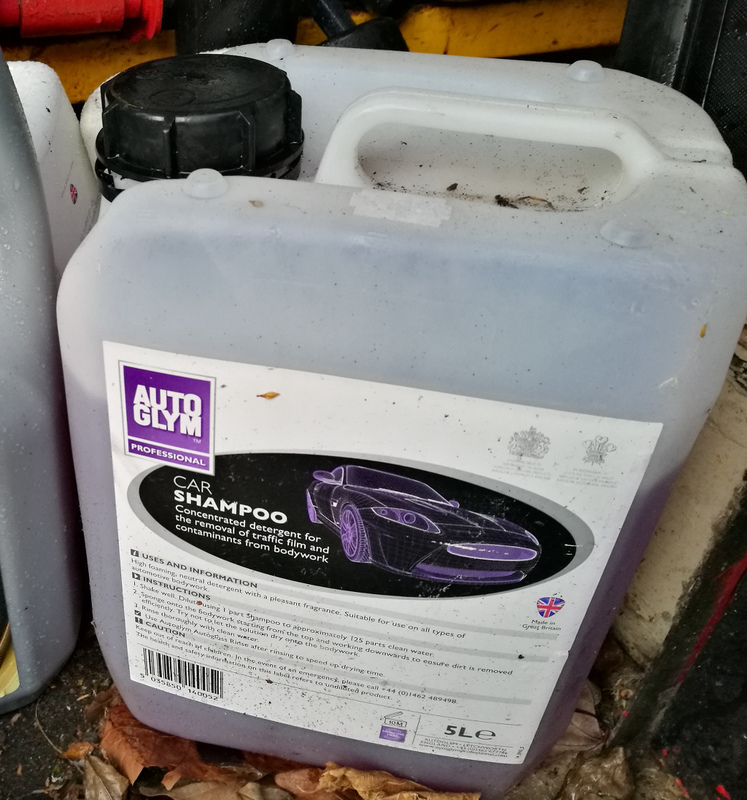 Takes a fair while to heat up 11 litres of coolant to full operating temperature when you can't actually take the car out the driveway! Heater nice and hot though (orders of magnitude better than that on either of the previous Estelles I've had), and about as much air as I'd expect bled out and it seems to be sitting right where it should on the gauge...Guess we'll find out once booked in for the MOT whether it behaves itself on the way there! Will ring the garage up and book it in tomorrow. Okay, booked in for an MOT tomorrow. Had a quick additional look over this afternoon, fluid check etc and gave the washer motor the obligatory once-a-year thwack with the screwdriver to get it to work again. Also checked all the lights over and stuff so I don't wind up with a fail for something daft like that. Nearside numberplate lamp, I'm looking at you. Will need to stick a fresh set of wiper blades on in the morning (have them here, just need to clip them on - it's tipping it down outside just now though) as one of the blades is falling to bits, and stick a bit of air in the tyres, then we'll be off. Fingers crossed, ending up with a fresh test an hour later - not breaking down in a cloud of steam half way to the test station. As soon as that's done I'll also be taking the Activa in for its test - will be the first time I'll have ever even sat in the car, so quite looking forward to that. Not expecting any drama on that for the test given the attention to detail that's gone into the work done on the car by the previous owner. Sorry for the delay, been a manic day! No photo of any fuel stop en route as the tank is full. The only brief failure to proceed is the fact that I now need to wait a bit for the DVLA to get their act together before I can tax it... hopefully won't take them too long. That leather interior looks a very welcoming place to be. It is a very nice place to be. Having previously owned an S2 Xantia it's quite an interesting game spotting all the detail differences. Most obvious so far being the lack of the clever door pockets and a comically tiny glove box. Other differences are the mechanical rather than digital odometer, thermometer in the rev counter rather than by the clock, slightly different typeface on the instruments, the rear window heater having its own switch rather than a button on the wiper stalk an IR rather than RF remote for the central locking and of course the numeric keypad for the immobiliser. The aux in socket on the stereo will be a bonus, and from what I recall it's not a bad sounding system. Just a shame that cruise wasn't offered on the Activa, despite pretty much all of the other toys (including a rear windscreen sun shade) being ticked by default. Having gone the other way, a mk1 activa to Zels old mk2 td I notice the same differences. The first time I closed the door on the td I thought I had broken the door pull lol. If it makes you feel any better Davie, it took me nearly a week to find the cubby hole under door handle. The Lada appears to have a vacuum leak again. It's idling about 500rpm fast and missing like a Mini on a wet morning at idle. Seems fine when driving, just at idle it's sounding like a sack of spanners. I'll investigate that shortly. 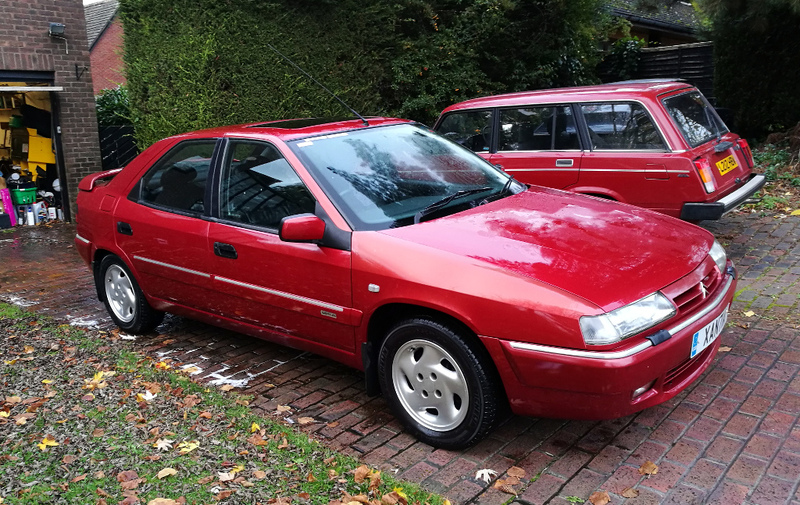 Haven't had a chance to drive the Xantia yet thanks to the DVLA having got themselves tied in a knot (now sorted we hope), but having had a poke around I've unsurprisingly not come up with a particularly large to do list. Just an exterior good clean to shift some green gunk from around window seals etc and to get some wax on the paint before the weather gets too much worse. The battery sounds like it's struggling a bit on a cold start, but I know she's not been driven properly in a while so probably just needs a proper charge. Likewise the cold idle stumbled a bit for a few minutes - again I'm not going to even bat an eyelid at that until she's had a proper run and an Italian Tuneup. The Activa is lovely (I've seen it for real quite a few times) and doing an Italian tune up in it sounds like my kind of mechanics! Have fun. I think everything on the car will welcome a bit of a spirited shuffle along a nice twisty road. Brakes need a bit of work to get them bedded in properly aside from anything else as they currently are a little lacking in bite. In a "new pads that need bedding in" sort of way rather than "something's wrong" sort of way if you know what I mean. Long term, if I bond with the car as well as the four or so miles from the test station back home suggest, I'll need to think about the cosmetics. Realistically, she wants (and deserves) a proper respray to get back to really A1 condition...though that then raises the thorny old question of colour. I actually really like the original Dante Red, though a proper Ferrari red would suit the car very well (especially I think with the more aggressive stance of the V6/Activa)...though I also can't get that orangey-yellow colour that used to be seen on Saxos, or possibly that deep coppery gold Peugeot used on the 306 out of my head...big car for it, but I think it would show up the lines well. I'm pretty set that it really should be a PSA colour though. Anyone got a Xantia brochure? Would be interesting to see the original colour choices. This car is *not* getting modified into something that looks like it's been driven at high speed down the tacky accessories aisle at Halfords...Plus to my eyes the Xantia has always been a very handsomely designed car. Probably got a couple of years to figure that out though, as it will take a while to save up for a proper professional respray. In the short term though it's going tonne seeing a LOT of underbody sealant and cavity wax. Right now though I'm looking forward to driving it! I think you will enjoy giving her an Italian tune up. There’s surprisingly little difference in the handling of Gabby with wider tyres on and an activa, apart from the lack of body roll on the activa. It’s all in the tyres I think. When I got my activa it was on new nexen on the front and old Pirelli on the back, and the nexens were hopeless for grip. They were changed to 17” uniroyal rain experts all round and the difference was immense. These are the wheels and tyres currently on Gabby. I also tried a different set of 17” alloys and tyres, can’t remember the make but they were not as good as the uniroyal but better than the nexen/Pirelli mix. And the 17” wheels did not harm the ride much, very slightly firmer and they improve steering feel. However that’s the uniroyal, them on the standard 15” size may also be good. As you know the activa you have had not had a lot of use lately, and will be none the worse for a decent run with spirited driving. If you find a “runway” to try it out, my one with the same boost controller yours had clocked 145 on the runway! So they are not slow lol. Mind you mine was driven as intended by me, and its previous owner to me for most of the time. I also have lacquer peel, I am going to do the bonnet and roof in a satin black, probably a wrap but possibly paint. 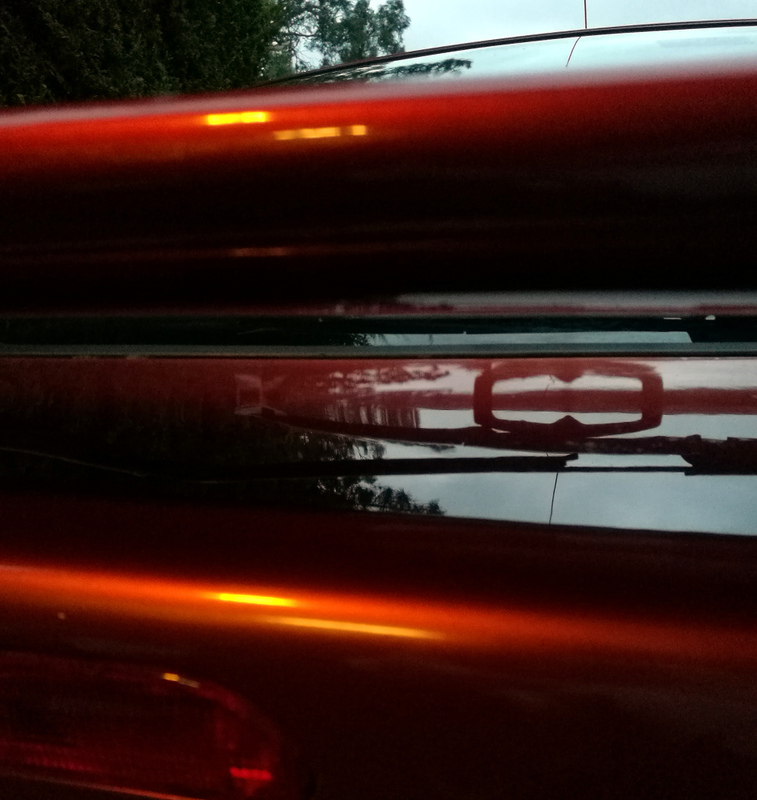 I was going to do the whole car, but the sides are all ok and have a good shine when cleaned. Actually had a surprisingly productive day around the house today. However does mean that I didn't really have much time to do anything car related. I did however get two tasks done. 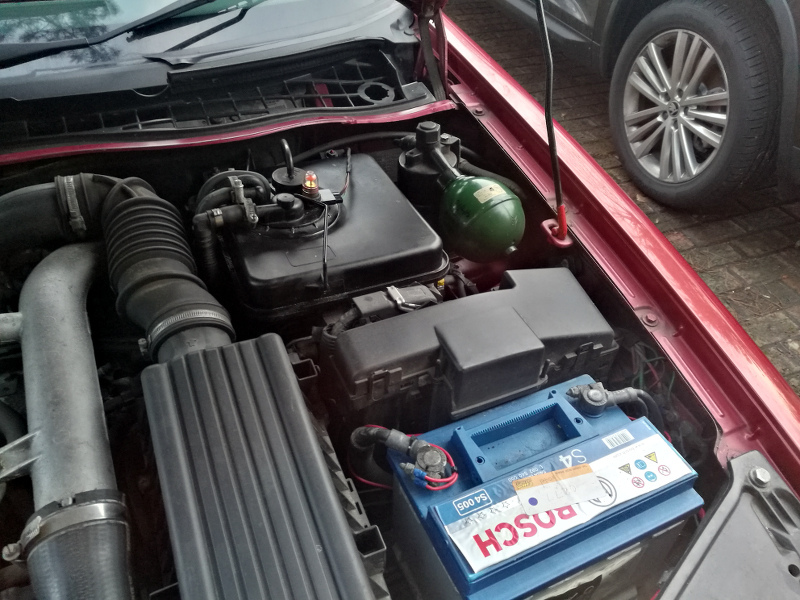 Firstly to plug the Saab into the battery charger as it's rather flat and I really don't want to kill a year old battery. Second was to attack the Activa with the pressure washer. Now...How do you go about pressure washing a Dante Red Citroen? VERY CAREFULLY...That's how. Luckily I've been playing this game long enough to be pretty good at that. 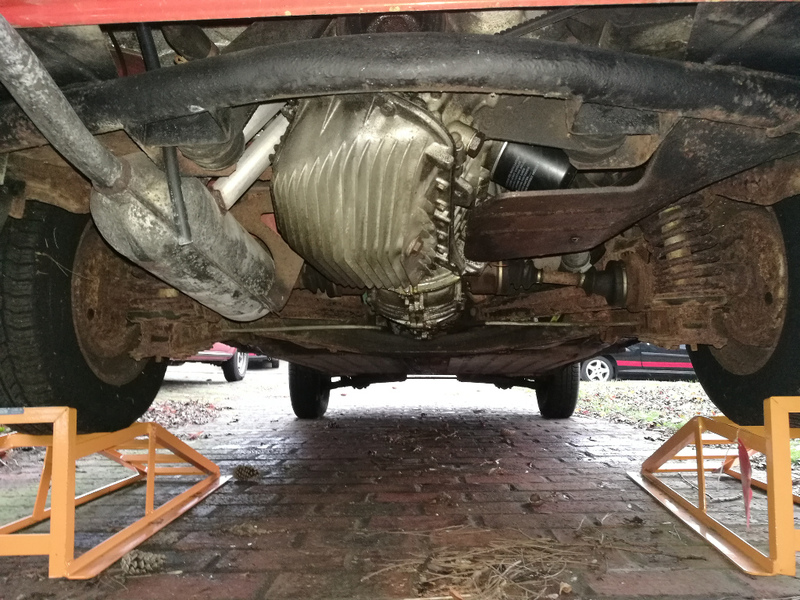 The car in general wasn't actually too grubby to be honest, save for a couple of fingerprints on the wings that were the inevitable result of the recent work on the front brakes and driveshafts. 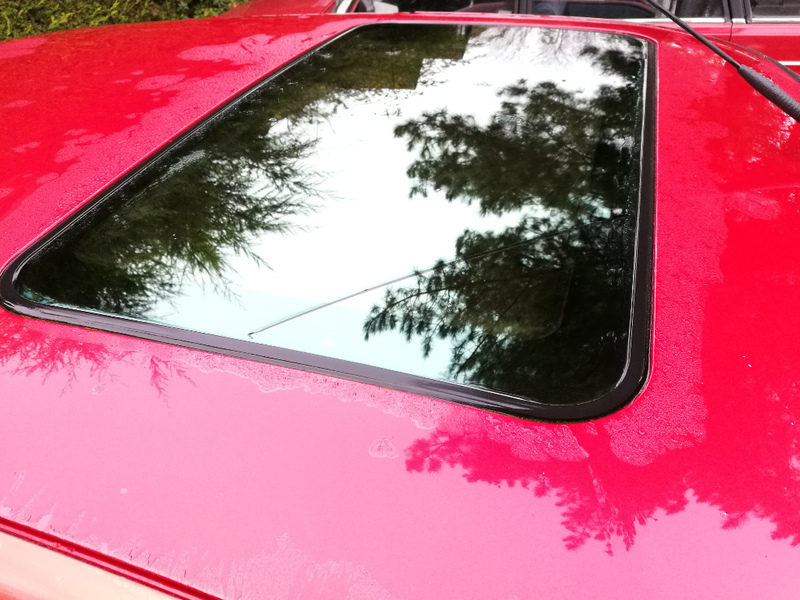 What there was however was a lot of green gunk growing in all the window seals, the roof gutters, around all the bumper/door trims and around the sunroof. Easy enough to deal with though! ...Which overall made more of a difference than I was really expecting. If time and weather permit I'm hoping to give it a quick skim over with the polish and wax tomorrow. Well didn't really get a chance to do much as we've had a friend staying with us who's having some health problems so I've been helping keep an eye on them. Should look pretty good when I'm done I reckon. Aaaaaand we have a V5. Less than a week's turnaround including complications in the middle due to an odd situation, hats off to the DVLA for actually being efficient...I have to admit I was quite ready for them to have been really helpful on the phone and for the V5 to then never appear! The Lada is now officially off the road until spring time rolls around. Quite well timed as I've got quite a few new bits on the way for it - and I need to figure out why it's idling like crap again - Vacuum leak most likely, usually is! Edit: only had chance to take it out for a quick run round the block this evening, will go out for a proper run tomorrow. One thing is immediately very difficult to my old TD - that's the sheer magnitude of the torque surge when the turbo spools up. The Activa really is properly fast. There's a tricky to define line between "quick" and "fast" for me. This is definitely in the latter category. Going to go for a run over to see a mate in Banbury tomorrow I think...and see if I can avoid those cursed 50mph bits as far as possible. The only real mark on the interior was a bit of a scuff on the usual bit of the seat bolster on the driver's seat. 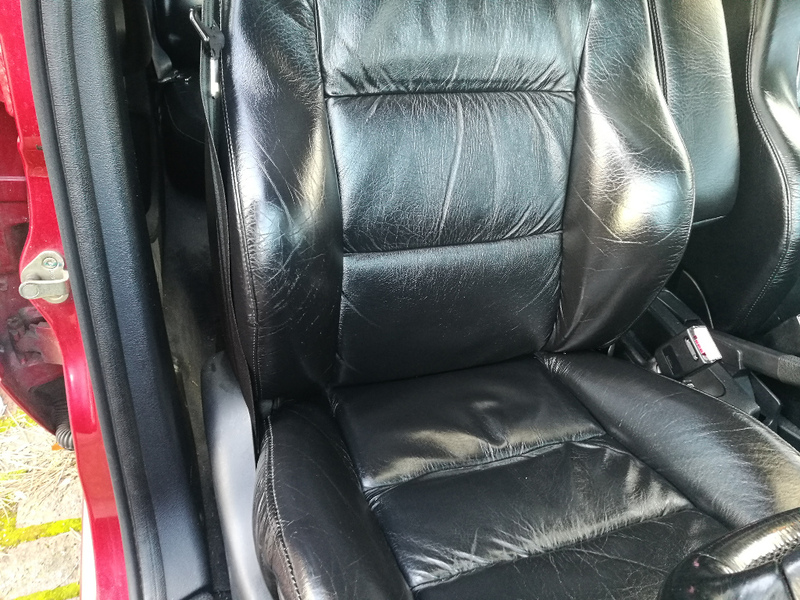 Bit of black leather dye on there quickly sorted that out. It's still there obviously, but now you really wouldn't see it unless you were specifically looking for it. Given there's a show over at Stoney Stratford on New Year's Day I'd hoped to get some cleaning/polishing done today. However by the time I'd dispatched my various tasks for the day and walked the dog I had about 30 minutes worth of useful daylight left. So instead I contented myself with doing the usual weekly walkround checks. While I was at it, I finally gave in to my OCD and tidied up the additional wiring around the battery for the headlights and gave the top of the LHM tank a wipe down. 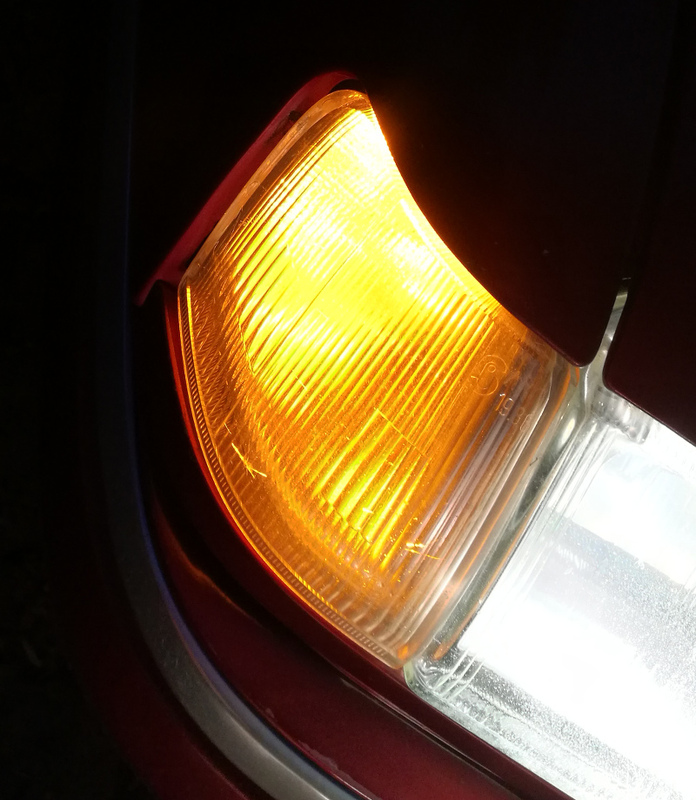 I also noticed that the front indicators had turned a distinctly pastel shade of orange, so stuck a fresh set of lamps in there. Aha! Now I realise that is Jim's old Activa! It's a fabulous car and was a regular at Citroen Car Club events. In case you didn't know, the annual Citroen DS and 'Chevrons' (all models) weekend rallies are held at Little Horwood, about 6 miles from MK. In 2018, the DS rally is June 9th/10th and the Chevrons Rally is September 8th/9th. Xantias are welcomed at both, of course! Will hopefully get along to both of those events! It is indeed Jim's one, not a car I'd been looking for nor ever expected to have a chance to own, but it was one of those situations where the pieces just fell into place perfectly! Didn't realise that Dante Red (on the S1 at least) was an Activa exclusive. I worked for a Citroen dealer when the Activa was launched and got to bring home the brand new demonstrator to impress Mrs6C! 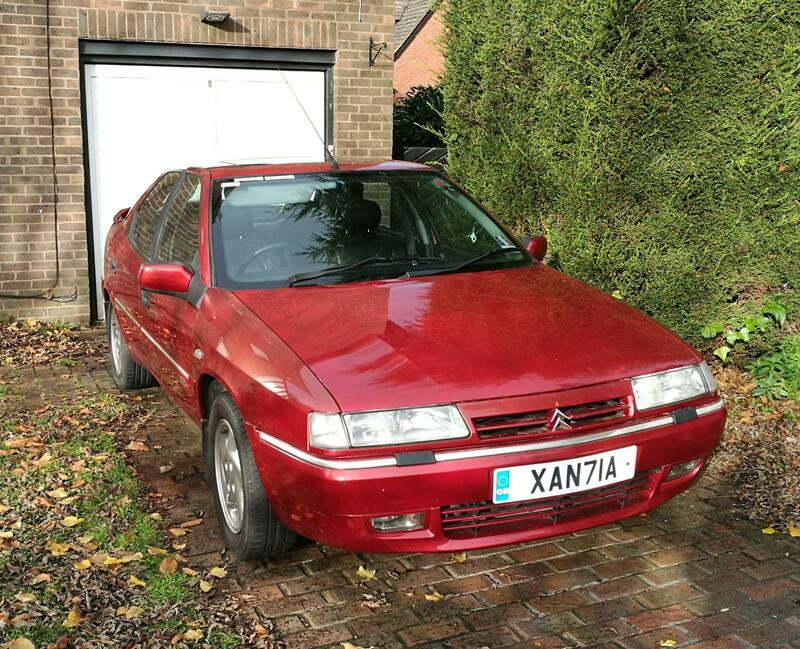 Loving that Xantia and the plate just finishes it off nicely. I'd love to have a go in an Activa sometime - I've been watching videos of them and they confuse my brain. I can hear the tyres squeal but with no body roll they just don't seem to be going very fast even when flat out. The body control is uncanny, the best test I find is the way you can chuck it into and off a roundabout. There's no lurching or pitching during the weight transfer. It really does make anything else - even stiffly sprung cars like modern Audis - feel utterly under damped. Can definitely see how it could get you into trouble though, I doubt there's a huge amount of warning when you get to the limit of grip. I'd really like to have a chance to find out where that is somewhere with plenty of room - appears to be well beyond the realms of commonsense on the road though! Always welcome to take a look at this one if you're in the area, that's half the fun of owning rare cars, getting to share the experience with others. The perfect car for the city of roundabouts then? All being well I'll be able to admire it at Stony tomorrow. The only downside (aside from its thirst!) is that I have a distinct suspicion that it's not going to be a kind car to tyres! It's the ultimate jack of all trades I think. You can trundle around town, paste it round a track, load it to the roof with shopping or waft along the motorway, it just doesn't care. Shame Citroen have chosen to kill the system off. I've long believed that the Xantia in general is a massively underrated car in any form. I totally agree with your last sentence Zel. Activas are hard on front tyres, I found running 17” wheels with 215/45/17 tyres improved the steering feel and the grip a bit more and did not upset the ride too much. Uniroyal rain expert was my tyre of choice. Those wheels are currently on your old td, uniroyal on the back and vredestien winters on the front and she never loses grip. I actually rate the 1.9td higher than the activa. 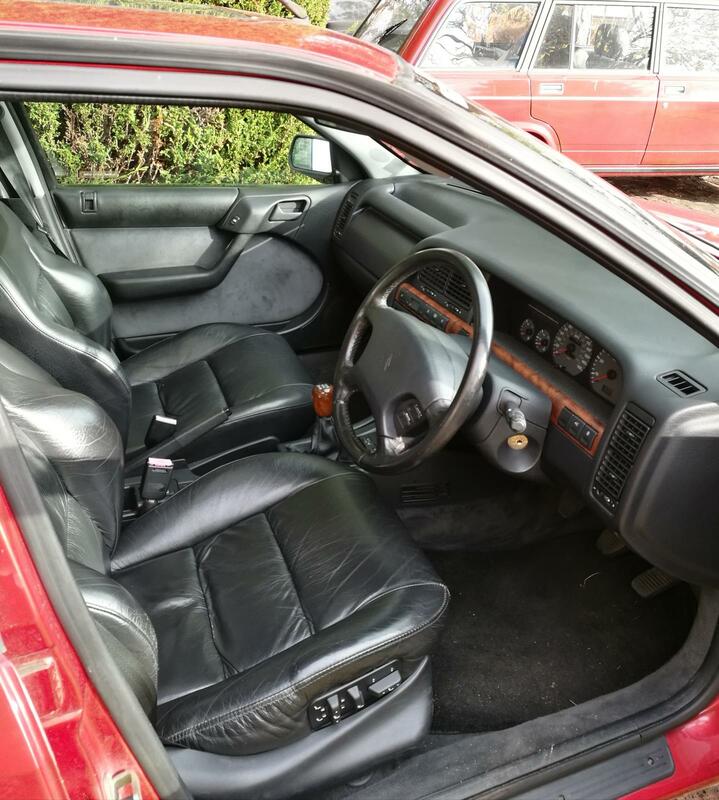 That’s perhaps because of the leather interior in her now. It’s the comfiest car I have ever had, and she has done over 5000 miles in 3 months on mostly veg without missing a beat. Utterly brilliant cars. Shame that only a few other manufacturers ever made use of oleopneumatics. Had it become mainstream, everyone would have had their own "magic carpet ride".